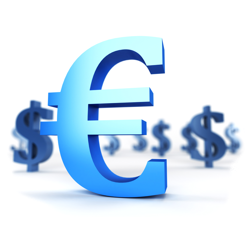 The euro was initially hurt by the morning's weak European data before the US followed suit in the afternoon. Firstly, European GDP figures came in below expectations, save for the Germans of course, which put further pressure on the ECB to ease monetary policy. Then poor retail sales data from across the pond raised concerns about the US' own outlook. The figures pretty much cancelled each other out, meaning that the EUR/USD currency pair closed almost entirely unchanged for the session. Following the sell off the day before, the euro had a day of reflection and ended up just about where it started off. The euro-dollar market was quite jumpy though, changing direction many times, but it never strayed too far, rising 10 points to $1.3715. Traders will look forward to the US Initial Jobless claims this afternoon, which will be more eagerly anticipated than normal. The euro had a tough day following the influential German Zew surveys. The investor confidence measure fell for the fifth straight month and hit a sixteen month low. This disappointment, coupled with reports that Germany's central bank would encourage further stimulus from the ECB in June's meeting, saw the euro/dollar fall 55 points to $1.3703. The euro had a quiet day against the dollar amongst the quandary that was the move in the stock market. The currency pair spent the majority of the session within a 20 point range around the $1.3760 mark, however this was to be expected given how light the day was on the data front. Today, currency traders can look forward to the German ZEW surveys in the morning and US retail sales in the afternoon. The euro continued to ease on Friday following Mario Draghi's comments on Thursday. CFD trading investors have been selling the euro ever since and the single currency fell 230 points to close the week at $1.3750. The ECB will be much happier now and their comments seem to have had the desired effect. However, this is a bit of a Catch-22 for traders because at the end of the day, part of the aim of the ECB is to de-value their shared currency. Much more movement and they may deem a rate cut unnecessary.